About three years ago now, I was experimenting with multiple overlapping images to look at the sea horizon, and discovered that what I really needed was a camera that would take the equivalent of three 35mm frames as one continuous negative. As there is no such camera on the market, and cropping down a 5x4" negative would have caused its own problems, I built my own camera. 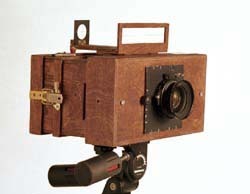 The first two cameras were constructed mainly from birch ply, as this is easy to work, hardwearing and fairly stable. The very first was built around a Schneider 150mm lens for 5x4" format, with a fixed focus on infinity (I was only planning to take pictures of the far sea horizon). This combination of lens and film gives a view of about 9 x 41 degrees. The negative size is 24x112mm (about 1x4.5"), or small enough to fit into a 5x4" enlarger. This is the same basic camera, but with a different front half to fit a 90mm Super Angulon lens, giving a view of approx. 15 x 64 degrees. As I began to use the camera in a wider variety of ways, particularly for night time photography, I developed a stepped focus system for the camera, allowing me to focus on infinity, 11.4m (37'), 8m (26') or 4.2m (14'). 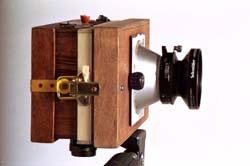 The most recent version of the camera uses rollfilm rather than 35mm, and produces a negative 56 x 240mm. It is much more cumbersome and slow to use, needing a ground glass screen for composition and focusing, but the larger negative gives so much extra detail and information that I now use it almost exclusively. The rollfilm camera is usually used with a 210mm lens, giving about the same field of view as a 90mm lens on the smaller camera.